MBR Mountain Bike Trail at Coed y Brenin Visitor Centre (NRW)01341 440747workCycle RouteMBR (black severe grade) Moutain Biking Trail (11.43 miles, 18.4 kilometres). This is a challenging trail throughout offering some sweeping descents like 'Bugsy' and 'Pink Heifer' as well as Coed y Brenin's most demanding stone pitched 'Badger' and 'Beginning of the End' and natural sections like 'Cain'. Now also featuring the rebuilt and modernised 'Abel' with a series of fly offs to test your skill. 'Falseteeth' has been given a makeover and been brought right up to date with cutting edge design and quality construction. Now featuring the 'Cavity', the largest technical trail feature at Coed Y Brenin. This trail is a real favourite; it’s got a great mix of classic CyB rocky gnarlyness, fast, flowing singletrack, new and contemporary features and sections to bring it up to date with modern riding styles. getting spat out the exit with as much style as you can muster! It’s a blast that puts a big grin on your muddy face! This trail is severe with unavoidable flyoffs and while you can roll down them all, you might want to ask yourself if your skills are up to it. More information in relation to whether or not this is suitable for you and where you can get training can be found on the Natural Resources Wales website. MBR (black severe grade) Moutain Biking Trail (11.43 miles, 18.4 kilometres). 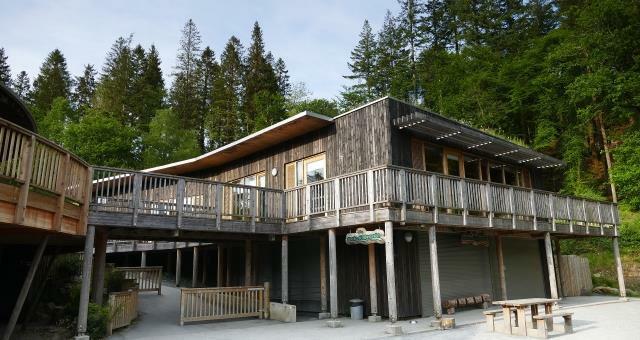 Coed y Brenin visitor centre The Visitor Centre has the following facilities: Toilets (including accessible toilets) Showers (in male, female and accessible rooms) Café (see above) Shop Information desk Picnic sites and BBQ There are a number of picnic tables around the main car parks within Coed y Brenin Forest Park plus many more on the waymarked walking trails. Some of the picnic tables have metal frames for holding disposable barbeques. There are also stone BBQ plinths in Glasdir and Ty'n y Groes picnic sites. Please ensure all fires are extinguished and tidied up after use. East off the A470, 8 miles North of Dolgellau just North of Ganllwyd, South of Trawsfynydd/Porthmadog. Follow the brown tourist signs. Local public transport is available, however the nearest train station is Barmouth. Cycle Network: NCN route 82, Lon Las (North) and Lon Las Cymru all pass through the centre.